I'm still in awe of our trip to Switzerland, the country has so much to offer in terms of climbing, hiking, air sports, etc etc, basically it's an outdoorsy person's dream. My good buddy Sean had just moved to Vienna and I needed to get to Dublin for work so we looked at whether the dates would line up and boom: before I knew it I was on my way to Switzerland. 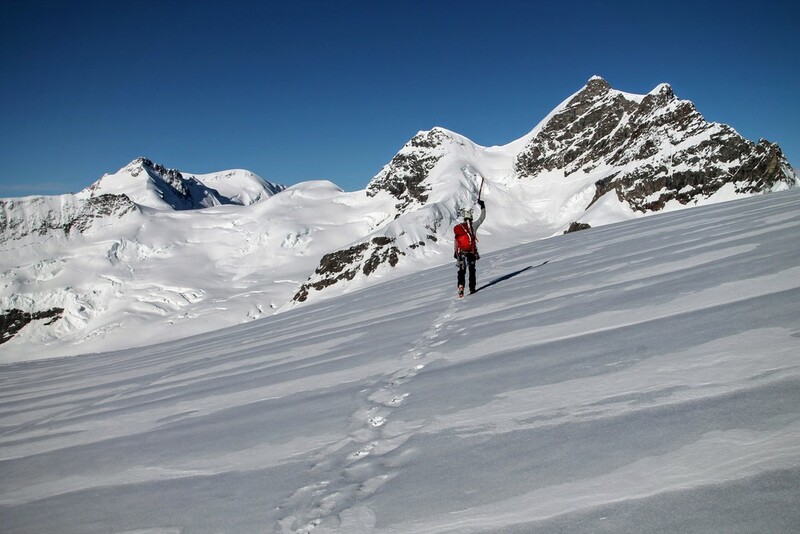 Our tentative plan was to tackle the well known Eiger and Matterhorn (which I was admittedly pretty terrified of, being more of a rock climber than an alpine mountaineer), so I was relieved when questionable weather and snow conditions forced us to rethink the plans. After 48 hours of travel fun (including an unplanned sleep in Zurich when my Swiss Air flight was late coming in and the trains had stopped, thank goodness for my friends Frank & Judy who gave me a place to crash) I hopped a train to meet Sean in Interlaken and we started up the railway through the mountain to the station Jungfraujoch. 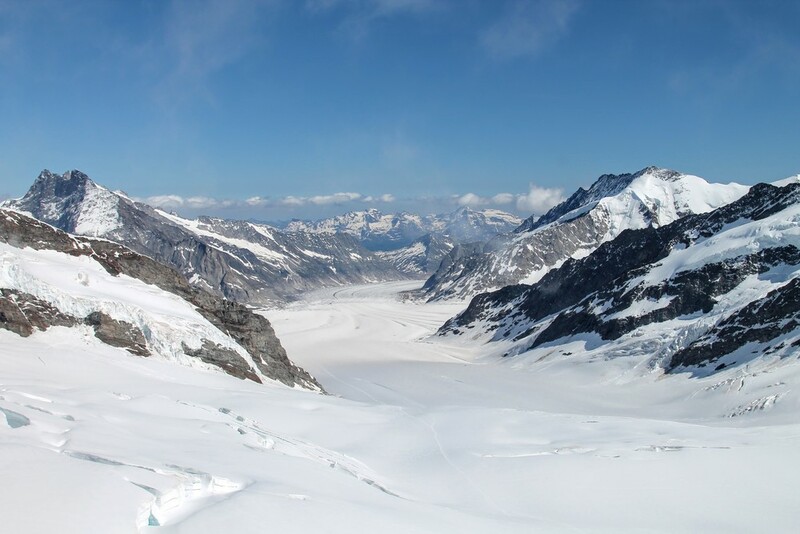 It's crazy, they tunneled straight through the mountain, and at points you can exit the train and look out directly onto the Northface of the Eiger, you could even step out onto the route and start halfway up if you were so inclined! 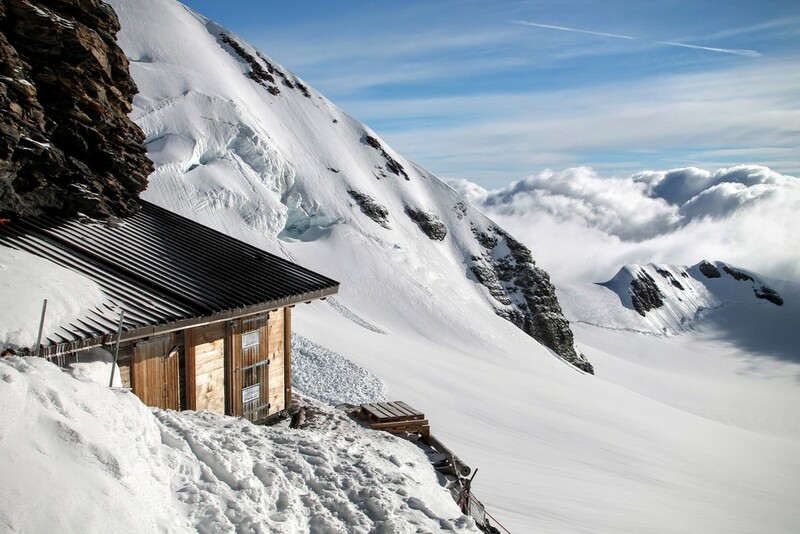 Located at 3,658 metres (12,001 ft) the hut is one of the highest owned by the Swiss Alpine Club. To be honest I was expecting a shack, but never underestimate the Swiss, this place had a massive restaurant, kegs of beer, pots of fondue, and felt more like a 3 star hotel than an alpine bivy. Not having actually exercised much that day, Sean and I were overwhelmed by the hearty meals they served. Bread and cheese, then cheese soup, then cheese salad, then cheesy lasagna.... Perfect meals for after a climb but maybe not before. A combination of food coma and jet lag found my sound asleep at the table, after which I politely excused myself to rest up for the big climb. Morning hit and it was time to get after it. Conditions were perfect, stoke levels were high, and the base of the climb was just a short walk away. Off we go! The snow was perfect and we could see most of the route we'd be taking. One of our Swiss friends from the hut was already cruising ahead of us, about halfway up the route by now. Climbing down low went fast and easy. There was a well defined route with steps and only a few difficult rock sections, some we soloed and a few we broke the rope out for briefly. Higher up the climbing got a little more difficult and a LOT more exposed (evident in my lack of picture from those sections). At times we were climbing on beautiful and terrifying knife-edge ridges, sometimes less than a foot wide with thousands of feet of exposure on either side. By the time we were approaching the summit I was wigging me out, I'm not super confident on crampons or snow yet and we were solidly in don't-fall territory. The sides were steep enough I don't think there would be much hope in self-arrest, and you were going to fall for a long long time before you'd stop, certain death for sure. Type 2 fun! Luckily Sean is a confident and safe partner who knows how to encourage me when I get 'the fear', so we broke out the rope to try and protect (ha!) some of the final ridge sections. 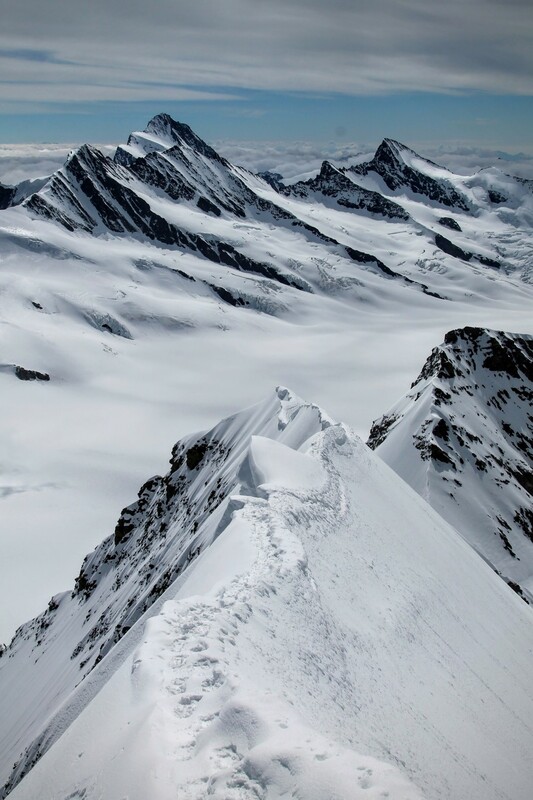 Really it was more for show, and basically your best hope would be to jump off the opposite side if the other person fell, luckily it never came to that and soon we were on the summit! Our badass Swiss hut friend who not only solo-ed the route before us, but then skied down the mountain... Intense! We played around on the summit for a bit before turning to head down, the top is great but it's only half of the climb, and the descent is usually the dangerous bit. Luckily the descent was fairly uneventful (besides a bunch of grumpy Swiss guides, who aren't ever too happy that we didn't pay one of them to drag us up there) and before we knew it, we were back on solid ground, off to the hut to eat ALL the cheese!